Wow, the first week of 2016 has come and gone. Makes me think that time sure does fly by! But you know, as advanced as a society we may be, we still love a good old fashioned cake. That's why this week's tutorial is a throwback cake I found in the 1972 Wilton Yearbook. I purchased the yearbook (and many other years) on eBay because I wanted to try my hand at some throwback cakes/cookies/cupcakes throughout 2016. I am just in love with the old school way of cake decorating and thought it would be fun to recreate some from the yearbooks. Here's the cake I chose: a simple yet elegant violet cake. It's easy to make and can be used for almost any occasion--just swap out the colors. So let's hop into that time machine and go back all the way to 1972! Start by placing a dot of mint icing on your flower nail and set a 2"x2" square piece of wax paper on top. The icing will secure your wax paper to the nail. Use a piping bag fitted with tip #102 to make the leaves. Place the widest end of the tip closest to the flower nail. Hold the bag at 45 degrees and pipe using soft up and down motions. Increase the length of the leaf as you get to the middle and then decrease back towards the end. Pipe 15 leaves and set aside on a baking sheet. Stick a flower template onto the nail. Using the smaller circle as your guide, pipe the petals of the violet with tip #59. The template will help you keep the petals uniform and evenly spaced. Pipe 30-40 violets and set aside on a baking sheet. When you've piped all of the leaves and flowers, pop them into the fridge for 30 minutes to set up. 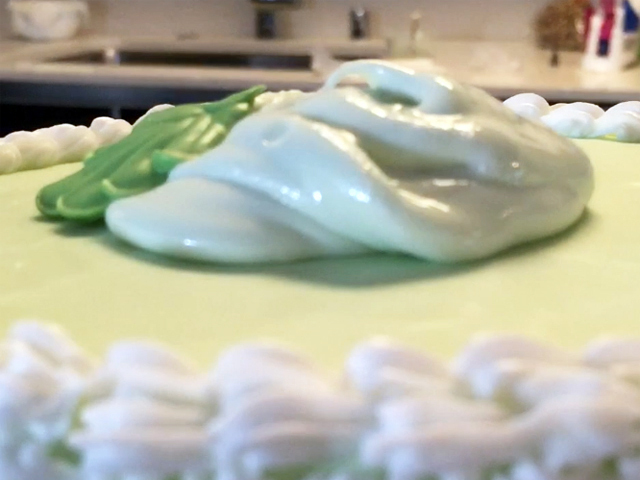 Use tip #16 to pipe a shell border along the bottom of your cake. Hold the piping bag at a 45 degree angle with the tip touching the cake board. Apply light pressure to the bag while slowly lifting and pulling it towards the right. As you finish the shell, decrease the pressure, stop and pull to cut off the icing. This technique requires practice to learn it well. Don't give up! With the same tip #16, pipe garlands all around the cake by using a tight zig-zag motion in a wide U-shape (like a smile). Remove your violets and leaves from the fridge and place them over where the garlands meet. You can do every intersection or alternate like I did. With a spoon or spatula, place a small mound of icing in the center of your cake. Start to assemble the bouquet by overlapping violets on top of violets. Don't be afraid to hide some of them completely in order to achieve height. 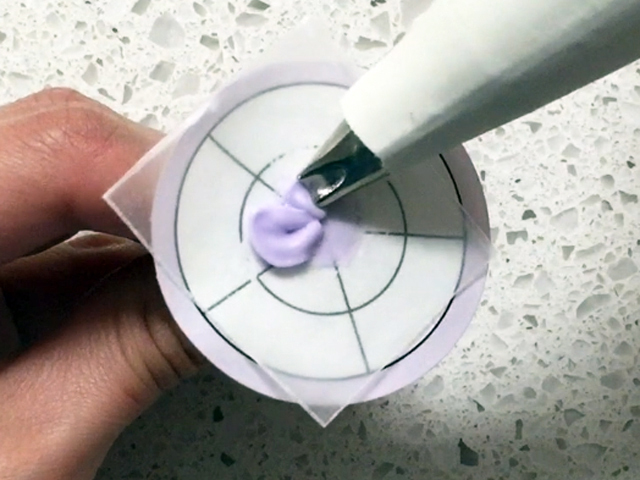 Finally, use tip #1 and yellow icing to pipe three dots in the center of each visible violet.